Register for a free My Pets account to feature you pet’s picture here! Include red, gold, cream, honey, white, gray, brown, and black. Minimal shedder but has a tendency to mat. It requires professional clipping 4 to 6 times per year. Can adjust to both city and country living. Makes an excellent apartment dog. The Lhasa Apso is a shaggy breed of nonsporting dog used to guard monasteries, temples, and households and revered as a symbol of Tibetan royalty and as a good-luck talisman. Its name stems from Chinese words meaning "barking sentinel" or "lion". It is also called the Tibetan Apso, a reference to its origins in Tibet in the 8th century BC; legend says that Tibetan priests who failed to reach Nirvana were reincarnated as lhasa apsos. They are easily trainable, responsive and alert nature and very long-lived. The Lhasa Apso is characteristically hardy, intelligent, and watchful. It is longer than it is tall and has a heavily haired tail that curls over its back and a long, profuse coat that covers its eyes. 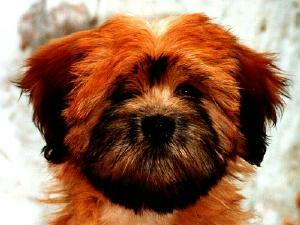 The coat of the Lhasa apso may be of various colours, but golden-brown shades are preferred by most breeders. The hair is so long it is often groomed to fall over the eyes and face so that only the muzzle peeks out from a curtain of hair. Its ears are pendantlike and heavily feathered, and nearly obscured by hair. The tail forms a lush plume over the back and its eyes are medium-sized and dark brown. It is also known as the Apso Seng Kyi. The Lhasa Apso has excellent hearing and will give a good early warning at the approach of strangers. The Lhasa Apso was a traditional gift from the Dalai Lama. Disclaimer: Pets.ca cannot be responsible for the accuracy of the above presented information. Please double check all information prior to making any decisions about purchasing this or any breed. If you think we have made an error with some of the information presented here, please e-mail us at breedprofiles@pets.ca. This Virtually indestructible ID Tag features a picture of a doggy angel in the middle of it. Available in small for cats and small dogs.